I decided to record all of my spending last year. Not sure if I had anything exactly in mind when I did this but I thought it might result in something interesting. If nothing else it should answer that never-ending question of "where did all that money go?" This is a fairly limited view of my spending because it is missing two things. It does not include my wife's spending which includes such things as car insurance, and it does not include anything directly taken out of my paycheck such as health insurance and money I put into my 401(k). The typical middle class person in Los Angeles spends 65% of their income on housing and transportation. I have always found this to be a bit silly, these are the areas where you really get the least benefit for your money. I at least have managed to stay well under this trend. About 25% of my income went to rent, 8% went to my car, and 6% to airline tickets. That adds up to 39% of my income spent on housing and transportation. This is much lower than this when you consider that my wife does not pay rent and pays far less on transportation. I doubt our total percentage of income spent on these two things exceeds 30%. 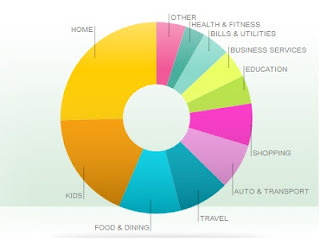 My spending on food and dining was 10% of my income. This is somewhat higher than I would have guessed, but does not seem particularly out of line considering how much time I spend cooking or at restaurants. What was a little more surprising was the break down of this component. A whopping 73% of this spending was at restaurants and bars. Only 27% of my spending on food goes to grocery stores. On that list only Ralphs has a reward card program, and I only spent so much there because it happens to be the closest supermarket to me. I was glad to notice one thing on the list which I won't be seeing again. That is student loans. I spent 4.8% of my income last year on student loans, finally finishing them off.